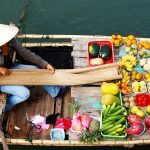 Get an insight into the nature and landscape, tradition and culture of Vietnam and Cambodia through a 15-day tour package that is well designed to bring you the most authentic experience. 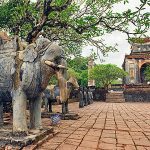 Our Indochina trip will help you unlock the mysteries of S-shaped country through a journey from North to South with tranquility nature, unique culture as well as fascinating activities. Coming to Cambodia, you will have a chance to encounter colorful culture and stunning beauty of the complex of Angkor. Travel with Indochina Tours to have unforgettable memories in the prominent landmarks in the two gentle countries. Welcome to Vietnam. Upon arrival, you will meet your private driver and local tour guide, then transfer to the hotel for check-in. After breakfast, we will start the day to visit Women Museum. 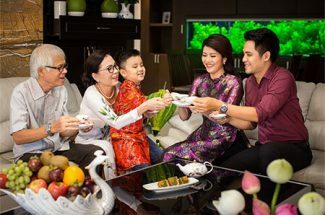 This museum offers a good view of the lifestyles, culture, and textiles of 54 ethnic minorities living in Vietnam and includes more than 25,000 items and documents illustrating the past and current achievements, contributions, and creativity of Vietnamese women. 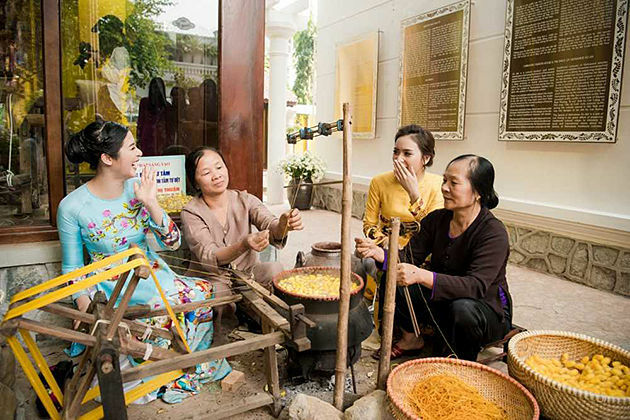 Afterward, you will be transferred to Van Phuc Silk Weaving Village, which is well known for its traditional sericulture, silk weaving and silk ware. You will have a chance to admire beautiful shirts, silk craft, ties, dresses and many other products made of silk. Lunch will be served at local restaurant. In the afternoon, you will participate in the textile workshop and demonstrations to take hands-on natural dyed experiences. You will have opportunities to see the wide range of natural color dyed on to antique fabrics, how the organic dyed product made from leaves, roots, barks and other environmentally safe pigments. Experience yourself by hand-on an indigo dyed product. Afterward, you will have dinner at Café des Arts de Hanoi, a popular expatriate café, with changing exhibits of paintings by local artists. Then you continue your sightseeing walking tour to visit some of the biggest art galleries such as Nguyen Art, Viet Fine Arts, Green Palm, Apricot, Gia Huy and Thang Long. 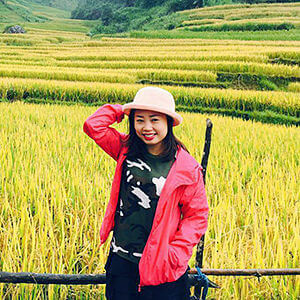 Be leisure until transferring to the train station for Sapa. Arrive in Lao Cai Station in the early morning, we will meet our local guide and transfer to Sapa. After breakfast, we will vote to a beautiful hike through the breathtaking scenery of Sa Pa valley. 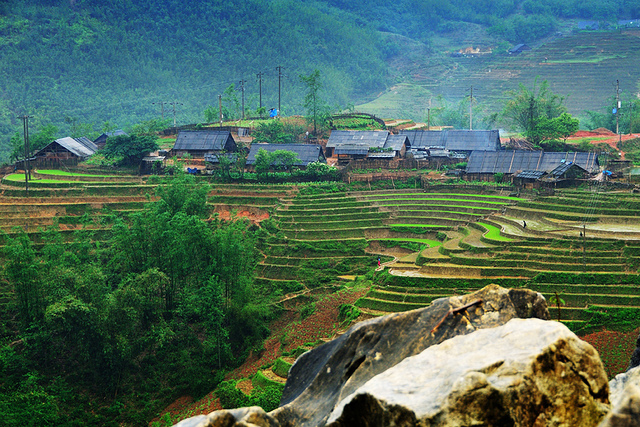 Along the route, you can feast your eyes on the rice terraces hidden behind a mist of the morning. 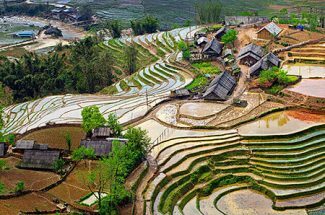 Follow a small track, cross Muong Hoa River and pass stunning rice terraces on your way to the Black Hmong village of Lao Chai. Continue through the colorful rice terraces you will reach the village of Ta Van Giay. Then continue to stroll along the Muong Hoa River, you will cross a small suspension bridge, roughly 2km from the settlement. 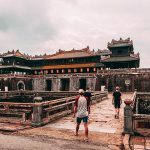 Here you can explore a fascinating collection of rock carvings which depict some beautiful images of the man, stilt houses and beautiful decorative patterns. We have lunch in a local family. The following walk continues through a bamboo forest to Giang Ta Chai, a Red Dao ethnic minority village. After taking a rest nearby a waterfall, you start climbing uphill to a road where the car is ready for your journey back to Sapa. After breakfast, we take 4-minute Mountain Train through valleys, viaducts, and tunnels offering beautiful views of surrounding villages as well as nature. Reaching the Cable Car station, we get off the train and enjoy another 20-minute cable car ride up to the top. Normally, travelers have to spend at least two or three days to reach the Peak of Fansipan Mountain on foot. 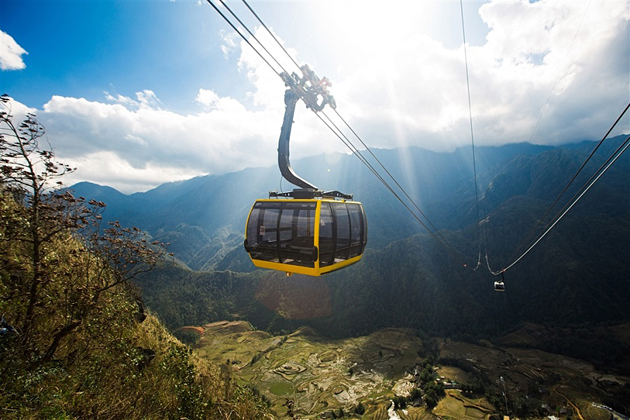 However, with the newly three-rope cable car system, we can easily to soak up the peak and spectacular surrounding within half a day. After a 20-minute ride, we start challenging yourself with 636 high steps up to Fansipan Summit – which is considered ‘The Roof of Indochina’ with 3,143-meter height. 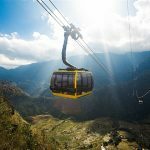 Enjoy the spectacular scenery of Hoang Lien Mountain and lush forest, we walk down to the cable car station and ride back. Take the Mountain Train back to town and have lunch in a restaurant. Arriving in Sapa town, the rest of the day will be free until returning to Hanoi by Limousine van. Drop off at the hotel in Hanoi and overnight. Pick up at the hotel in Hanoi, we transfer to Halong Bay then to Cai Hai Port. On arrival, we get on our boat and enjoy a welcome drink. You will have lunch while cruising into the primitive Lan Ha Bay. You can opt for kayaking through the poetically beautiful Tra Bau area or enjoy swimming in the emerald water. After that, we visit a fish farm and socialize with the resident fishermen to learn more about local life and how the people work every day. Return to the cruise and enjoy “Happy Hour” drink time while participating in the cooking demonstration. Delight in the shimmering atmosphere of thousands of stars while eating an expertly prepared dinner on the top deck of your boat, all while floating in the center of the serene Lan Ha Bay. Dinner with fresh seafood on boat and overnight at the Bay. Overnight on board on Lan Ha Bay. Wake up in the early morning and begin with a Tai Chi session or a photo hunt. We then enjoy breakfast in the restaurant. On a bamboo boat, we will visit Bright Cave and a serene round lake surrounded by rich forest and precipitous stone cliffs. 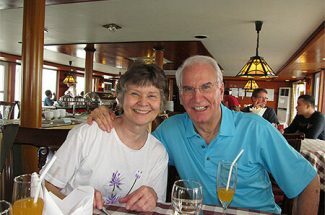 After that, you return to the cruise to pack your luggage and check out of your cabin while cruising towards the port. Enjoy an extraordinary buffet lunch before getting back to the mainland and get on our bus back to Hanoi. Return to Hanoi, check in hotel for short relax before moving to watch My Village show. 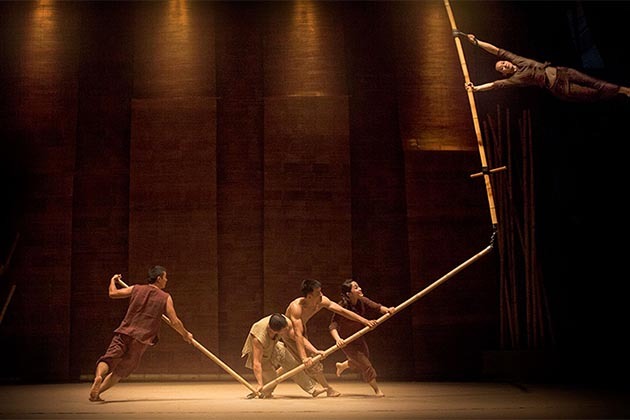 Illustrating delicately the poetic Vietnamese village through its stunning cirque, the cultural show My Village draws the audience to the world of top-notch art creativity, where whoever stepping into will bring home unforgettable memories of the charming and Vietnam. 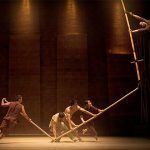 The show with its new-circus approach is presented which encompasses many art genres, including breathtaking cirque, skillful juggling and contortion will take viewers from one surprise to another. After the show, get back hotel for overnight. After breakfast, we will be free until your driver arrives to transfer you to Noi Bai Airport for your departure flight to Hue. Upon arrival, we will be met and escorted to the hotel. 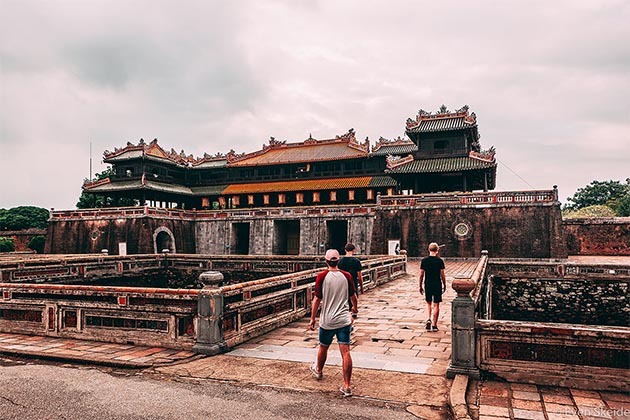 After that, we will visit The Imperial Citadel where the Nguyen Dynasty ruled between 1802 and 1945, and explore the ruins of this wonderful monument. We will then head to the Hue Royal Fine Art Museum, which is housed within the former Dien Long An Royal Palace. Finish our day with the local Dong Ba Market to see the daily life of local people before returning back to the hotel. Following your breakfast at the hotel, we will move Toa Kham Wharf, depart to Thien Mu Pagoda, a historic temple in the city and a symbol of Hue, is located nearby the Perfume River. It will be a wonderful place for you to relax and refresh. 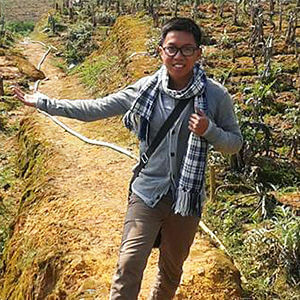 Afterward, spend 2 hours to stroll or bike around quiet Thuy Bieu Eco-village. You will have a chance to visit local gardens, old ancestral temple, and contact with local people. 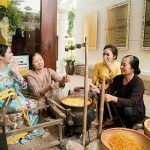 It is a great opportunity to visit some handicraft families (the incense making family, the joss paper making family and the paper painting family) to learn about the daily life of local people. End up your morning tour by steeping your foot in medicinal herb water – a traditional therapeutic practice and enjoy an excellent massage by blind people. In the afternoon, we will visit Artist Vinh Phoi at his studio and learn about his life and inspiration. Enjoy the performance of traditional live music while having dinner at Tropical Garden Restaurant. My Son, located 69 km southwest of Danang, was an imperial city during the Cham dynasty, and 75km far from Hoi An. It is the former capital of the ancient Cham civilization that ruled Central Vietnam from the 2nd to 13th century. Their religion was primarily derived from Indian Hinduism. 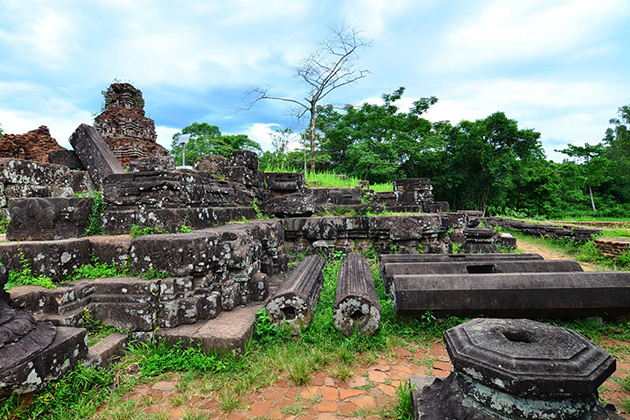 Considered to be one of the best-preserved Cham structures in Vietnam, My Son is comprised of seventy Hindu-like towers and temples dating from the 2nd century. 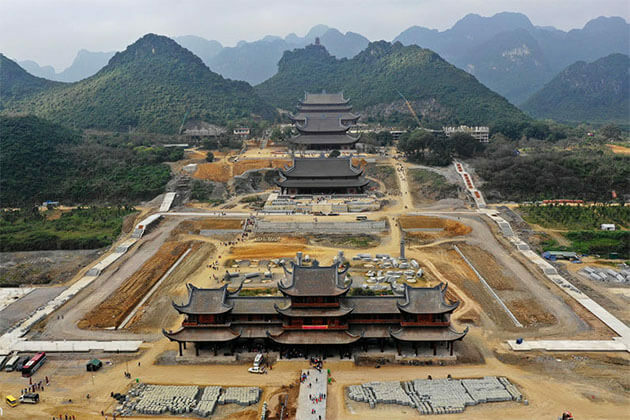 My Son Sanctuary is a large complex of religious relics that comprises more than 70 architectural works, including temples and towers that connect to each other with complicated red brick designs. The outstanding feature of the Cham architectural design is the tower, which is built to reflect the divinity of the king. In the morning, we are picked up at the hotel by local tour guide and the driver then depart for the ancient Cham ruins of My Son. 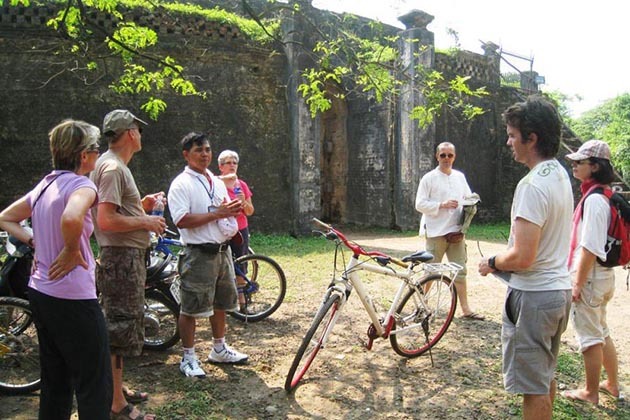 On arrival, we visit the Tra Kieu capital which was the former administrative center of Champa Kingdom. It’s time for you to marvel at the majestic ancient ruins at My Son Sanctuary. 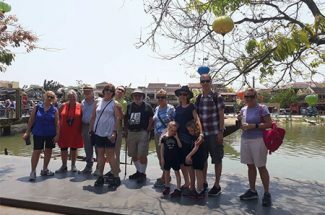 Return to Hoi An ancient town for lunch and start your afternoon journey by a walking city tour around the most attractive sites of the old town to visit the Japanese Covered Bridge, Tan Ky old house, the Pottery Museum, the Cantonese congregation, the silk street of Hoi An, the temples and pagodas of Chinese appearance. After breakfast, we will be free until your driver arrives to transfer you to the airport for your departure flight to Ho Chi Minh. As you arrive, our local guide and driver will pick up & transfer to Cu Chi Tunnel for our half day visit. 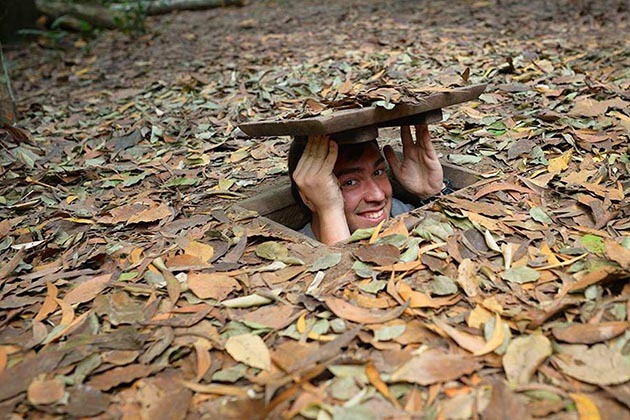 Cu Chi Tunnels is 50 km far from the city center, located in Cu Chi district, Ho Chi Minh city. These were the location of military campaigns during American wars designed with an immense network of connecting underground tunnels. 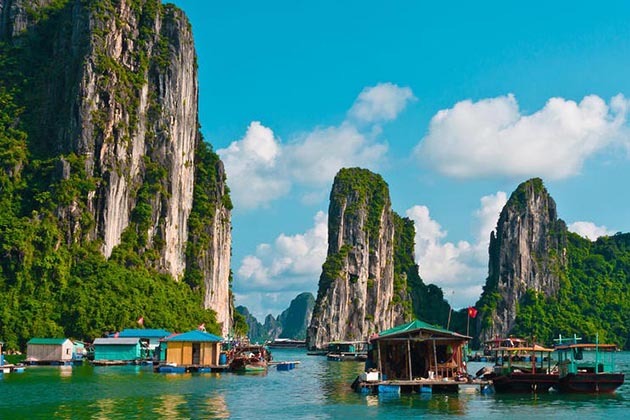 This area is listed a “should-not-be-missed” site for all visitors traveling to Vietnam. 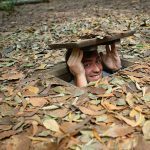 Visiting Cu Chi Tunnels, we will first watch a short introduction video showing the foundation, activities… of tunnels and people lived here in the past, then we will experience to crawl all the safe parts of the tunnel system; enjoy some special cassava and tea that served free. For those who want to challenges themselves can explore all three adventurous levels of the tunnels. Later, we can go to the shooting range where we can try to fire real bullets: (costs US$3/bullet) or free for shopping at the souvenir shops. Back to Ho Chi Minh City to relax and overnight at the hotel. Lunch will be served at a local home. After lunch, you can relax and explore at your own pace by walking around, and enjoy some kinds of fruits while listening to traditional music. One more must-do thing on this trip is biking! 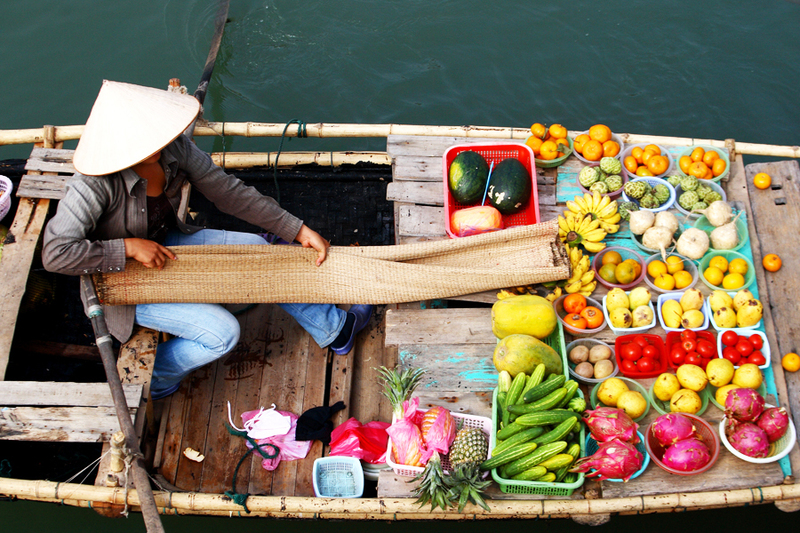 Numerous fascinating experience is waiting for you as you bike on village paths to see the local farms, houses, real life and the ancestral ways to pick up fruits in Mekong Delta… The last destination in your cruise is Vinh Long city where we take our own vehicle back to Ho Chi Minh City. Have breakfast at the hotel. 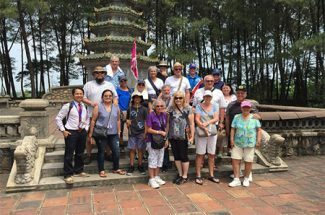 Today we will enjoy the city tour through the most highlight of the bustling city which includes the Old Post Office, Notre Dame Cathedral, the former Presidential Palace and Saigon Fine Art Museum. You will have lunch at the Mandarin restaurant and then spend time exploring artist studios and galleries including Mr. Son’s Tu Do Gallery, the first private contemporary art gallery in the country. Your afternoon will be free to wander Saigon’s vibrant central district with its many arts and crafts shops. Upon your arrival at Siem Reap International Airport, you will be welcomed by our local guide and driver who will transfer you to the hotel. Rest of the day is free at leisure. This morning, wake up early to view the sunrise at Angkor Wat. Then transfer back to the hotel for breakfast. 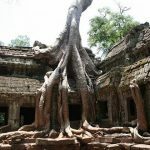 We will have a 45-minute journey to Northeast of Siem Reap through the beautiful village to visit the pink sandstone temple of Banteay Srei, founded in 967. Banteay Srei Temple-“the Citadel of Women”, cleared from the creeper plants and trees that invaded it, is indeed of absolute, rare beauty, and fineness. It is also considered as the jewel of the Classical Khmer Arts. Get a closer look into every single detail of this sculpted pink sandstone temple which is a real enchantment to the human eyes! This afternoon, we continue to marvel at several surrounding temples, then return in the direction of Siem Reap. 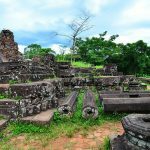 Along the way, stop to explore another of the lesser visited temples – Beng Mealea, which is similar in size to the better known Angkor Wat (both were built by Suryavarman II). 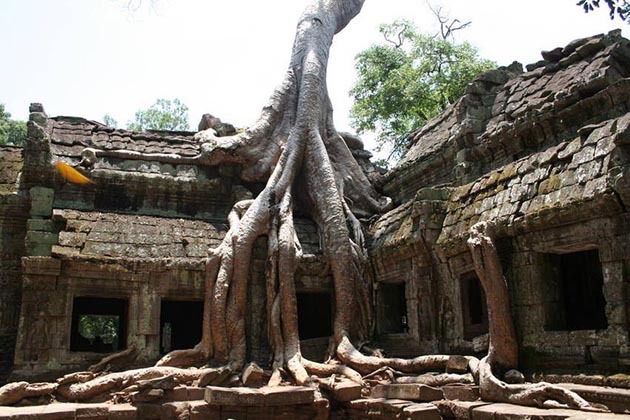 Utterly swallowed by the jungle, and with minimal restoration work, you can easily imagine what it must have been like for early explorers discovering these temples for the first time. Return to Siem Reap in the late afternoon. After breakfast, start the second day to explore the part of the Angkor complex. 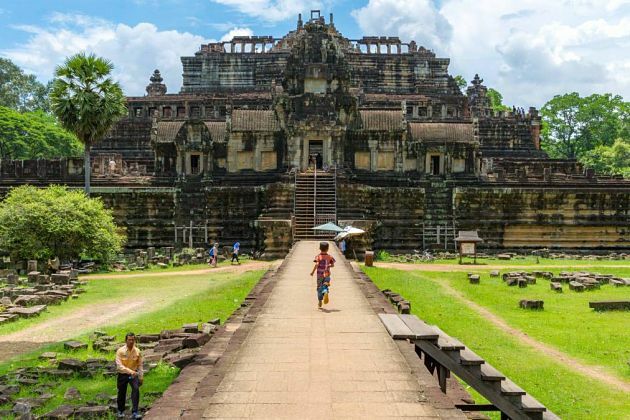 Your Cambodia tour will take you to visit Angkor Thom including Bayon Temple, Phimeanakas Temple within the Royal Palace enclosure, Baphuon Temple, the Terrace of the Elephants and the Terrace of the Leper King. After lunch, it’s time for us to soak up the most famous temple in the world – Angkor Wat – an architectural masterpiece built in the 12th century. Stretching approximately 210 hectares, Angkor Wat has been regarded as one of 100 most worthwhile destinations in the world. End the tour with the climb to the summit of Bakheng Mountain Temple to enjoy a spectacular sunset before returning to the hotel. Breakfast at hotel, today is free at leisure until time for transfer to airport for your departure flight to your home. Trip End!!! Meals as specified in the itinerary with authentic local food. You are highly recommended to travel with a passport valid for at least 6 months following their plans departure BUT I always recommend to the valid at least 1 year and having at least 06 blank pages for immigration stamps upon arrival in and departure. 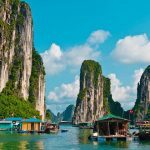 Regarding Vietnam visa, there are several ways that we can get it organized, please see the below options and let me know which one you’d prefer. You can go directly to the Embassy/Consulate in your country and work some papers, the fee is paid directly to them as well. We will apply for the visas at the Immigration Office in Hanoi on your behalf based on the information you sent us (full name, passport details, and date of birth). For this, I will send the approval document directly to you by the scanned attached file. All you have to do is print this letter out and bring one copy with you. Upon your arrival at the airport, the approval document will be sufficient proof of your visa status. Please ensure that you pick up the visa form near the customs checkpoints and fill in the details before you queue for immigration. You’ll need a color passport photo and the fee for the visa stamp ($25 per person to pay directly to the Immigration Clerk). For this service, we will offer. We can assist you to obtain Vietnam visa online but need to send us your passport copies and passport size pictures. It costs 40.00USD/person. We will send your E-visa after 5-working day. All you have to do is print this out and bring this with you to show the Immigration Clerk at the airport. Don’t need to fill up any form or just queue and go through. 30 days visas are available in advance of arrival at Cambodia embassies or Consulate in the USA. The visa fee varies from between US$8- 42 depending on the agreement with the various governments. It is also possible to obtain a Visa-on-Arrival at the following international checkpoints for tourist visa validity for 30 days in Cambodia. It costs 35 – 40.00USD/person. Require your valid passport & passport size pictures.